Recently we got a whole bunch of Raspberry Pi systems at work - the cheapest platform for building Dashboards. Everybody loves those little cute boxes - but nobody wants to deal with the setup and maintenance. 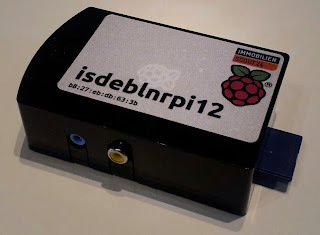 The kiosk-browser package is of course also the base of our Pi-based setup. But how does it get onto the Pi? As a result I have now a one-step process that turns a fresh SD card into a ready system. Use qemu-arm-static to chroot into the Raspbian image on my Desktop. There are a whole load of other recipes on the Internet for doing that. The two is24- DEB packages to most of the setup work. If the demand is very high then I can see if I get them released.